With the unofficial end to summer happening this weekend, I couldn't be more excited for Fall. Yes, I love summer and all that is has to offer... but being a November baby, the Fall season will always hold a special place in my heart. The changing of the leaves, the cooler temps, and let's not forget... the FASHION! As we sit in limbo for the next month or so, I plan to live in a variation of this outfit. 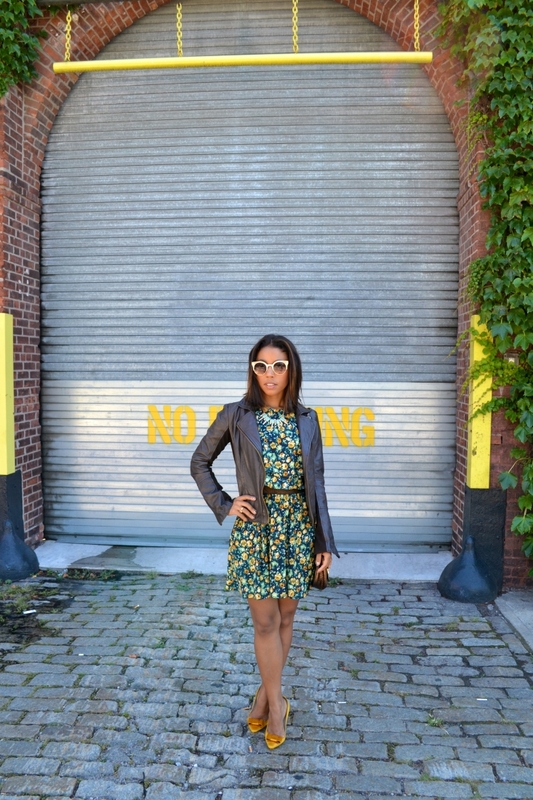 In my opinion, a floral print dress topped with a light leather jacket is the perfect pre-fall look! A leather jacket is great for the morning or evening when the temps are a little cooler and also adds a Fall layering vibe, without being too bulky. Now that we have our pre-Fall uniform in check... lets talk about the shoes! How A-MAZ are these pumps that I picked up last friday at Zara! OMG! I can't even express to you how much I love them. They're the perfect golden mustard yellow hue, in the of-the-moment single sole style. I can't wait to plan more Fall outfits around this fabulous piece!